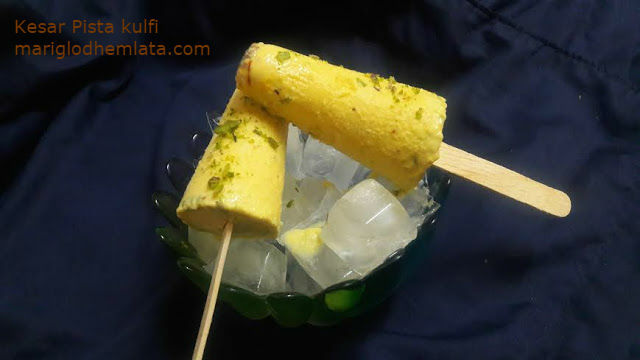 Creamy, delicious kulfi is a very popular frozen Indian summer dessert. Traditionally kulfi is frozen in a clay pot filled with ice. It is made by boiling the milk and reducing it to one third of it's original volume. Kulfi comes in a variety of different flavors, Normally kulfi is flavored with cardamom, this recipe is flavored with cardamom, saffron and pistachio. Combine the saffron and warm milk in a small bowl, mix and keep aside. Heat milk in a heavy bottomed pan and bring it to boil, once the milk comes to a boil, turn the heat to low and stir the milk continuous stirring and reduce the milk to more then half its quantity. Once it is reduced add sugar, milk made, mava, cardamom powder, saffron and chopped pistachio, mix it well. Turn off the heat and allow the mixture to cool. now pour the mixture in the kulfi molds, seal them tightly and freeze them in the refrigerator for 6 to 8 hours. Before serving allow the moulds to remain outside the refrigerator for 2 minutes and then unmold them, you can insert the wooden skewer stick and pulling it out. Garnish with chopped pistachio and Serve immediately.